As I've mentioned before, oral language is a huge predictor of future reading success. A common saying among reading professionals is, "If a child doesn't hear a word, that child won't say that word. If he doesn't say it, he won't read it." 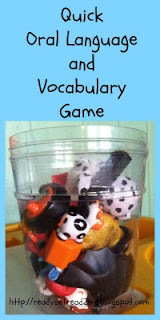 You can help your child grow his oral language with easy and fun games. We've been playing a super simple oral language game using objects we have lying around the house. Fill large container with small objects from around the home. Screw on the lid. Show the item to the tub to your child and say, "I spy something (object) and you use it to (description)" When the child guesses the correct object, unscrew the lid and let that child hold the item. For added challenge, let your child try giving clues to you. Here are some of the objects we included the last time we played. Some of the clues we used were, "I spy something black and you use it to fix your hair." or "I spy something with black and white spots and it is an animal." I've also found it is good to include figurines like batman or Papa Smurf because the boys LOVE when they get a special character! My boys love to play this game over and over again. I love the language that is built each time we play. Thank you for sharing these tips! I love enhancing my boys' language skills. Great ideas here! Such a lot of learning with little prep! This is something anyone can try right after reading your blog. Thank you for sharing. Great! Simple is sometimes the best.